E-Z-Go got its start in the industry with a cramped one-room machine shop in Georgia, two brothers, and their belief that they could build a better golf cart than the ones currently available in the market. From these humble beginnings, E-Z-Go has since become a world leader in transportation and a leading global manufacturer of golf cars, utility, and personal transportation vehicles. The company was responsible for the design and production of thousands of vehicles per year, most of which made use of game-changing technology and innovations aimed at improving vehicle efficiency and boosting user experience. In the 1960s, E-Z-Go joined Textron Inc., and is one of the latter’s powerful brands to-date, alongside Cessna, Beechcraft, Hawker, Bell Helicopter, Greenlee, and Jacobsen and Kautex. Currently, Textron Specialized Vehicles designs and manufactures all E-Z-Go vehicles, along with other commercial and industrial utility vehicles such as Textron Off Road, Arctic Cat, Jacobsen, Dixie Chopper, Cushman and Textron GSE – all of which are recognized leaders in their respective industries. Find all E-Z-Go Low Speed vehicles. Get your own E-Z-Go low speed vehicles today! Drop us a line for any inquiries or concerns. Introducing TechForce. A quick response, dependable service and a no-excuses approach to business—that’s what TechForce is all about. 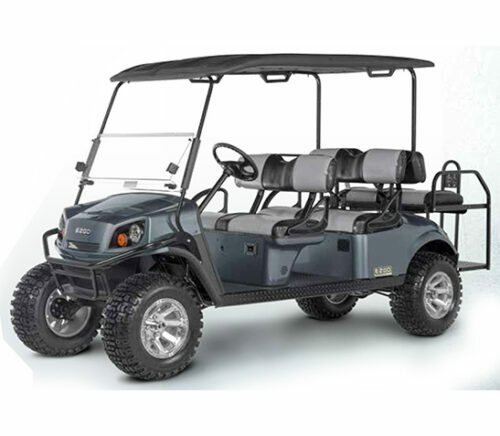 The RXV is a beautifully built 2-seater golf car that comes with a sturdy yet modern design and an elegant epoxy coating that adds to its flair. It has a mighty 4.4 HP motor and an efficient 48V battery system that caters to all of its power and energy requirements. The smooth steering and the hydraulic shock absorbers only add to the overall experience of the RXV. You need a reliable mode of transport within your community. 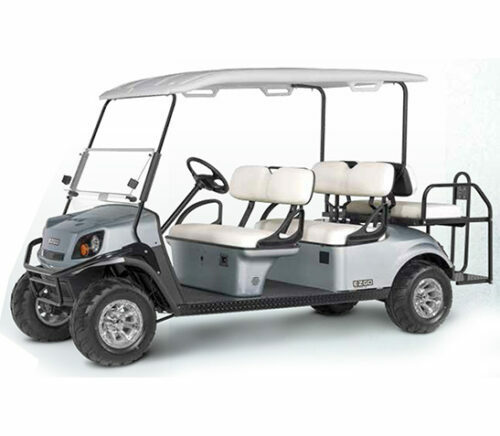 If you are looking for a more economical and reliable transportation means aside from a full-blown vehicle, then E-Z-Go’s Passenger series or Fleet RXV is right for you. All these models are perfect for use in master-planned and gated communities and easily supports the get-up-and-go lifestyle. 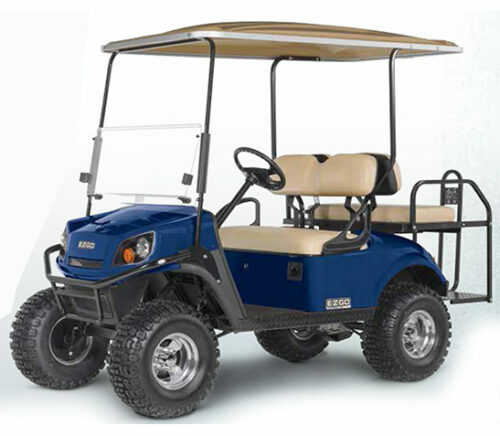 The Passenger series’ two models are powered by a 4.4HP motor and six 8V deep cycle batteries, with the Fleet RXV having a 4.4HP motor and four 12V deep cycle batteries. The models also come with other features such as four-wheel hydraulic disc brakes with full-time regenerative braking, three-point seatbelts, headlights, taillights, turn signals, and four-way flashers – making it safe to use as a family transport. You can either opt for the two-seater 2 Five 2 Passenger and Fleet RXV, or the four-seater 2 Five 4 Passenger. You want a low speed vehicle that runs on gas. If the only thing that is stopping you from getting a LSV is that most LSVs are electric, then you can opt for E-Z-Go’s aptly named Freedom series or the Fleet Txt – these models give you the freedom to choose between an electric or gas engine. All four models of the Freedom series and the Fleet Txt has the option of either running on electric – with a 48V AC motor and four 12V deep cycle batteries, or gas – with a 4-cycle 24.5 cu in (401 cc) low emission motors and single-cylinder OHV with hemispheric combustion chamber valve trains. The Freedom comes in four models and two seating capacity options: the two-passenger Freedom RXV and Freedom TXT, and the four-passenger Freedom RXV 2+2 and Freedom TXT 2+2. On the other hand, the Fleet Txt comes with a two passenger seating capacity. You need a low speed vehicle that can transport a lot of people and luggage. If you are looking for a low speed golf car that is spacious enough to seat four or more people plus their luggage comfortably, then the E-Z-Go Express series is the best one for your needs. All the Express models are beautifully designed with comfortable seats and hydraulic shock absorbers – ensuring that you will have a smooth ride anywhere. 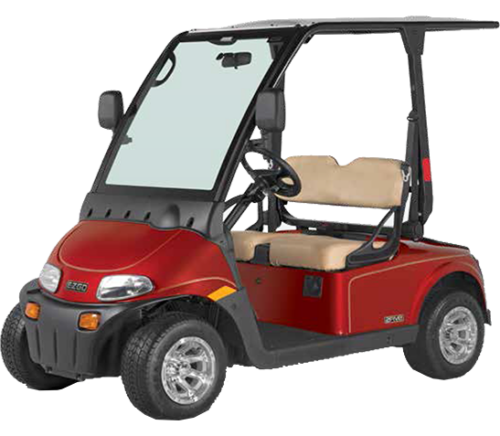 The Express low speed golf carts all run on a 48V DC shunt wound motor, and either six or eight 8 or 6V deep cycle batteries. The Express series also offers two choices of seating capacities, with some models having the option to convert the rear seat into a cargo deck: the Express S4 and Express S4 High Output that both seat four, and the Express S6 and Express L6 that both seat a maximum of six passengers. You are looking for a low speed golf cart that can provide refreshments. Whether you own a country club or is just an awesome host who ensures that refreshments are provided whenever wherever, you are sure to love the Refresher Oasis. This modern and trendy refreshment cart runs on a powerful 7HP AC motor and 13.5 HP single cylinder air-cooled gasoline engine. You will surely not run out of refreshments with this baby’s 500 capacity beverage bin with four divided compartments, 6.7 cubic feet of merchandising capacity, and 12.1 square feet of workspace. You need a low speed hauler. Looking for a low speed golf cart hauler? Then look no further than E-Z-Go’s Hauler series. The Hauler is a two-seater golf car that comes with a powerful engine and advanced braking and suspension systems. The Hauler comes in two models: the Hauler 1200 that uses a gas engine and has a bed load capacity of 800lbs. and towing capacity of 1,500lbs. and the Hauler 800 that comes with the option of either a gas or electric engine and has a bed load capacity of 500 lbs. and towing capacity of 720lbs. You are looking for an energy efficient and low maintenance LSV. If your main considerations for getting a LSV are energy efficiency and quality, then E-Z-Go’s Elite Lithium is right for you. Elite Lithium is a two-seater golf cart that comes with Samsung SDI lithium technology – making it extremely energy efficient and eco-friendly. A company that can provide quick, dependable service to your LSV is important for you. Of course, who would want bad after-sales service for their vehicles right? With E-Z-Go’s TechForce, you need not worry about your E-Z-Go low speed vehicle’s maintenance. Their largest nationwide network of experienced technicians, industry leading response time, and mobile parts industry are guaranteed to keep your LSV in good running condition.